Bing Crosby was an American singer and movie actor. His record albums have sold over half a billion copies and he has three stars on the Hollywood Walk of Fame for motion pictures, radio, and audio recording. He is the first actor to receive an Oscar nomination for Best Actor for the same character, Father Chuck O'Malley in Going My Way and The Bells of St. Mary's. He won the award for Going My Way. 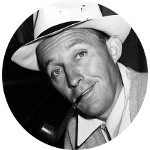 Bing Crosby was born Harry Lillis Crosby on 03 May 1903 in Tacoma, Washington. His parents were Harry Lincoln Crosby (aka Harry Lowe Crosby) and Catherine Harrigan. It is said that his nickname Bing was derived from “Bingo from Bingville” which a neighborhood kid had taken to calling him. The name was a reference to humorist Newton Newkirks hillbilly parody The Bingville Bugle which was a feature in the Sunday edition of the Spokane newspaper The Spokesman-Review. Bing Crosby has a number of Mayflower kinships. He is the direct descendant of William Brewster and a 7th great-grandnephew of John Howland and Edward Winslow. His presidential connections include Zachary Taylor, Rutherford B. Hayes, Calvin Coolidge, Ulysses S. Grant and others. He has a kinship to the current royal family of Queen Elizabeth II and to the infamous, accused murderess Lizzie Borden.